This is the second in a series of briefs published by Change The Story on topics related to women’s economic status. This report focuses specifically on occupational segregation, its impact on women’s wages, and the way in which it compromises Vermont’s ability to make the most of home-grown talent. Much of the data in this report is new or not regularly collected or published. 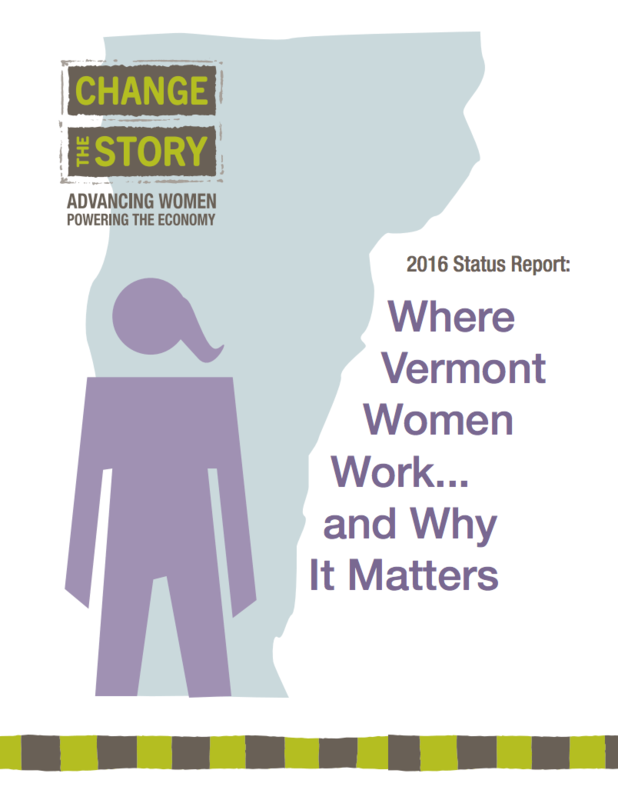 All of it is specific to Vermont and all is critical – not just in terms of what it reflects about women, but in its implications for the entire Vermont economy. Women who work full-time struggle to make ends meet. Of the 15 occupations in which women’s median annual salaries top $35,000, nearly half are in male-dominated fields. Occupational segregation, the uneven distribution of labor across and within sectors by gender, is the norm – not the exception – in Vermont. In 15 of 25 major occupational categories tracked by the U.S. Census, either men or women are 70% or more of all workers. Forty years after Title IX, women’s work continues to be women’s work. The gender balance in most traditionally female occupations has remained nearly constant from 1970-2013. Nearly half of women working full-time in Vermont continue to be employed in the same occupations in which they worked forty years ago. The next generation of female electricians, coders, and engineers isn’t in the pipeline. Young women are a small fraction of students who completed computer science, engineering, trades and technical programs at state career and technical high schools: 9% of those in information technology; 6% in manufacturing; 6% in transportation; and 5% in architecture and construction. While the gender breakdown is essentially equal among high school students taking Advanced Placement (AP) tests in calculus, chemistry, and biology, young women are a minority of students earning college degrees in physics, chemistry, computer science, economics, and engineering. Occupational segregation is costly – not just for women, but for employers and the Vermont economy. Nearly 60% of high-wage, high-demand entry-level occupations are those in which women are a significant minority of workers. Occupational segregation limits the pool of potential workers for jobs employers need to fill.